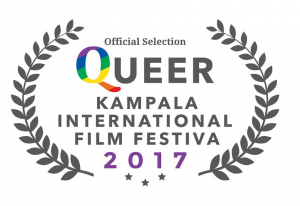 On Saturday Dec 9th at 2:30 PM the film Transfigurations–Transgressing Gender in the Bible was scheduled to be screened for the second annual Queer Kampala International Film Festival. The entire day of films on Saturday were around transgender and gender non-binary stories and documentaries. Transfigurations was included would have been showed at the secret location of the film festival in Kampala, Uganda. The event’s location is normally kept secret in order to protect its attendees. But organisers were told just before 2pm on Saturday that police were on their way and would be there within 30 minutes. Police turned up armed with AK-47 rifles and the event was shut down. Some reports suggest that organisers were safe and have not been arrested but this has not been verified. 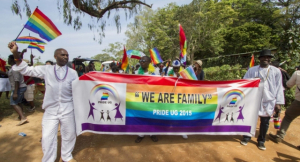 The US embassy in Uganda earlier this year condemned the forced cancellation of a Pride event. Uganda Pride, which had been expected to take place this month, was cancelled abruptly over the weekend, as LGBT activists said they had been warned they faced arrest if the event went ahead. I am sad for myself and my fellow filmmakers. I have written how how LGBTIQ film festivals have been life-giving to me and vitally affirming. Because of the police action, I have decided to share Transfigurations for free on-line up through January 6, 2018–a queer holiday gift and an on-demand film festival. Here is the on-line screener that reviewers have seen. You can read some of the reviews here. Transfigurations – Transgressing Gender in the Bible [Review Copy] from Peterson Thomas Toscano on Vimeo. 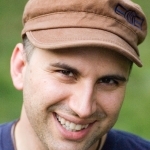 About Transfigurations: Peterson Toscano has shaken up Bible academics and received high praise for his ground-breaking, genre-bending, gender blending Bible scholarship. By unearthing the stories of gender-variant people in the Hebrew and Christian scriptures, Toscano’s one-person play deepens well-known (and lesser-known) Bible stories and presents an array of Bible characters with an array of genders. If you wanted to purchase the film for yourself, a library, church, friend, etc, you can get it through Barclay Press. The DVD has two versions of the performance, including the full theatrical version as well as the performance lecture version below.